Yes another newbie ! I have never designed a PC so this is a steep learning curve. I’m trying to create a new part, all the information that comes up either said “this is out of date as we have updated it” and sends you to a link that doesn’t show how to make a part, or shows how to edit a part. I’m trying to add a PCB mounted dual 18650 battery holder, can anyone help ? if it doesn’t suit, post why and I can change one or the other to match what you need. The battery holder I’m looking at creating in the link I posted, is a dual holder with 4 (2 x positive and 2 x negative) pins to mount on a PCB. Yeah it’s kind-of hard. If you know vector drawing, you have to do it in a special way, or if you know XML, you might be able to code it. Fritzing PART CREATION Video Tutorial Series Tutorials - Guides - How to's - & Experiences. I’m going to do a series of part creation videos. Open to fullscreen and select 1080p HD in the gear symbol, bottom left corner of the Youtube window, for max clarity. Fritzing Part Creation - Chapter1 - New Part Editor P.S. - Sorry about the voice, I’ve got a big nose. EDIT - Found a new internal Fritzing part maker that accompanies the New Parts Editor. Here is the part. Download the fzpz file then in Fritzing file->open->file name which will put the part in your mine parts bin ready to be dragged in to the sketch. As always (because I don’t have one of these) if you are making pcbs you should print the footprint out at 1:1 scale and check the footprint against a real part. As well if you want the mounting holes in the pcb you will need to drag a hole from the pcb part of the core parts bin over the hole in the silkscreen layer and set the hole size correctly (the drawing doesn’t have a hole size so I used 3mm). Thanks for your replies, sorry for my delay in getting back to you. As with most apps when you first start using them it’s a up steep learning curve, I’m slowly getting my head round it. I find knowing the right question means you will get the right answer, the problem is knowing the right questions to ask ! Here is what I came up with, I think is working, if you wouldn’t mind checking it that would be great, that way I will know if I have understood this correctly. A “Via” is a hole through both layers with a copper core thus joining both layer together at that point. When you place a part (in my case a Wemos D1 Mini) are the pint connects “Via”? Your part has a number of problems, as shown in this sketch shows. While I could detail the problems, but I suspect you would be better off just unzipping my part and modifying my parts svg files and modify that. stroke-width is in a separate window…"
Hopefully the comment on how corel draw does it makes sense to you since you look to be using Corel Draw. I changed the size of the mounting holes to be 0.086in as that is the closest standard drill size to the diameter of your pads. Try the new part out and see if it works better. Yes, through hole parts connections are the same as a via assuming the board is made by a company that makes the boards does plated through holes (home etched boards are usually not plated through). Once again thanks for your help. Yes the new part is better, I had played about a bit myself. Based on what you have said it seem there are “standard” drill hole sizes, I can’t seem to find a list of them, is there one? With the battery holder I know is a square pin and its about 1.5mm by 1mm, so base on what I have read online this means I need a hole of at least 1.8mm. Now, I think this the same for Corel and is it for Inkscape, if I draw a circle at 2mm, with a stroke of 1mm, the outside diameter is 2.1mm, and the inside diameter of the circle is only 1.9mm, this is because when drawing a circle you get half the stroke on each side (.05mm) so both side would be 0.1mm, meaning 2mm - 0.1mm = 1.9mm. the ones with text are what the Fritzing parts factory amd/or core parts use for the listed part. As far as I know they aren’t documented anywhere except the source code. Your best bet for drill sizes is to check with who is going to make your boards, or if you are doing it yourself what drill sizes you have. Your calculation looks right but the best way to check is to export the gerber files then edit the drill.txt file which will tell you what drill sizes are being called for, you can check the pad size in a gerber viewer such as gerbv (it has a measurement function). 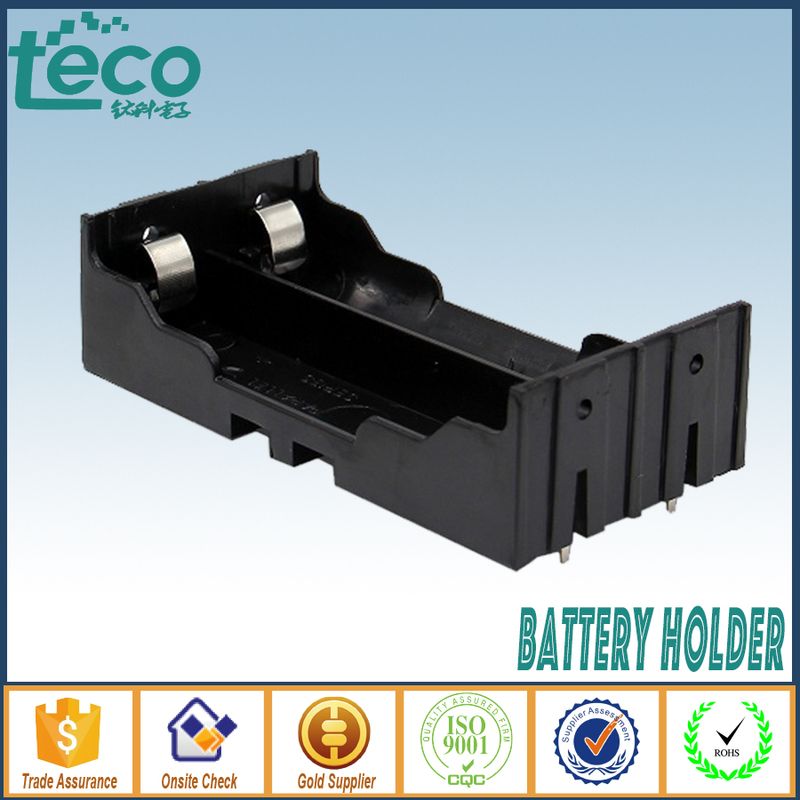 Is there a part for SINGLE 18650 battery holder ? Awesome thanks. I did search in forums and it only resulted in the dual holder design. anyways thanks.